Above: The centerpiece of The Haven on each ship is a private courtyard such as this one on Norwegian Gem. 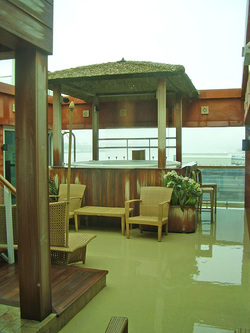 Below: The Haven also includes an exclusive sun deck. The courtyards on NCL's Jewel-class ships include a whirlpool (above) and an exercise room (below). Guests staying in the Haven on the Jewel-class ships can have complimentary breakfast and lunch in Cagney's Steakhouse (above). Options include full waiter servuice and meals cooked ala minute (below) or a buffet breakfast (next below). Accommodations include the multi-room Garden Villas, the largest suites at sea. These suites have their own private sun decks and whirlpools. Norwegian Cruise Line ("NCL") is well-known for its mass market cruise ship offerings. However, at least since the entry of Norwegian Jewel into service in 2005, NCL has been quietly developing its own brand of luxury cruising within its mass market ships. Recently, in connection with the planning for NCL's next class of ships, NCL not only turned the spotlight on its luxury operation but gave it a name - - The Haven by Norwegian. Essentially, NCL's approach to luxury cruising is built around having a section of the ship dedicated to its top-of-the-line guests. Such sections are not merely a corridor of suites with a concierge lounge. Rather, they are separate areas that include not only the accommodations but also dedicated indoor and outdoor facilities. As the ships have gotten bigger, the size of these areas has expanded as well as the scope of the dedicated facilities. In addition to the physical assets, NCL has staffed its luxury sections with very capable and hard working concierges, butlers and staff. Seemingly, anything that a guest wants to do, they will work to accommodate that request. It should be noted that not all of the suites on NCL ships are encompassed within The Haven. The line also offers a range of suites that are comparable to the suites typically offered on mass market cruise ships. The Haven is designed to compete with luxury cruise ship accommodations. Why would a mass market cruise line want to have a luxury operation? Hugo Vanosmael, Hotel Director on Norwegian Jewel explains: "We sail out of big cities and this is a reflection of that. We have a broad range of staterooms. We have something for everybody. There are all kinds of people and you need all kinds of people to fill up the ship. You have people who want to go the high end and you have people who are cruising the first time and go with an inside cabin." "There are some very high quality upscale cruises out there but for the most part, they are designed for older, more-affluent couples rather than younger affluent couples and families," elaborates Andy Stuart, NCL's Executive Vice President Global Sales and Passenger Services. "We think there is a massive segment of couples, with and without children, who are younger, who are looking for a younger crowd to hang out with but nevertheless like the good things in life. They do enjoy having their own space, having their own restaurant. They enjoy having a little more privacy than is typical on a large ship. We think that is the segment which The Haven by Norwegian fills most appropriately in the entire cruise industry." When people think of luxury cruising, they usually think of small ships. However, as Denis Prguda, Hotel Director on Norwegian Epic, points out, large ships can offer more than a small ship can. "It is all here. I call it Silver Seas within a 4,000 guest ship. You can go downtown [to the public rooms and dining venues on] decks 5, 6 and 7. But if you want luxury, you come up to decks 16 and 17." Thus, a guest traveling in the top accommodations can utilize all of a large ship's dining and entertainment facilities but when he or she so desires, the guest can retreat into the exclusive luxury enclave. "There are a lot of people that come that have sailed on five-star ships with other lines and they say 'we like the suites and the service here. We like it better because [NCL has] more perks than some of the five-star lines," adds Mr. Vanosmael. While The Haven is a luxury offering, it does not depart from the Freestyle philosophy that lies at the heart of NCL's approach to cruising. The guest decides when and where to dine and what shows to see. Moreover, it is upscale, not formal. "We don't want anyone to dress up who does not want to dress up. There are many people who like to dress up [but] there are many people who [do not]. It is all about Freestyle and choice," says Mr. Stuart.